We love these royal engagement rings. And how’s our royal wave? Well, we’re workin’ on it. In honor of Princess Eugenie’s royal wedding, we’ve rounded up royal engagement rings favorites and our affordable lookalikes (with price tags way shorter than these royals’ titles). JamesAllen.com is the expert destination for deals on engagement rings and fine jewelry – so whether you want to sparkle like Meghan Markle or glow like Grace Kelly, we’ve got you covered! 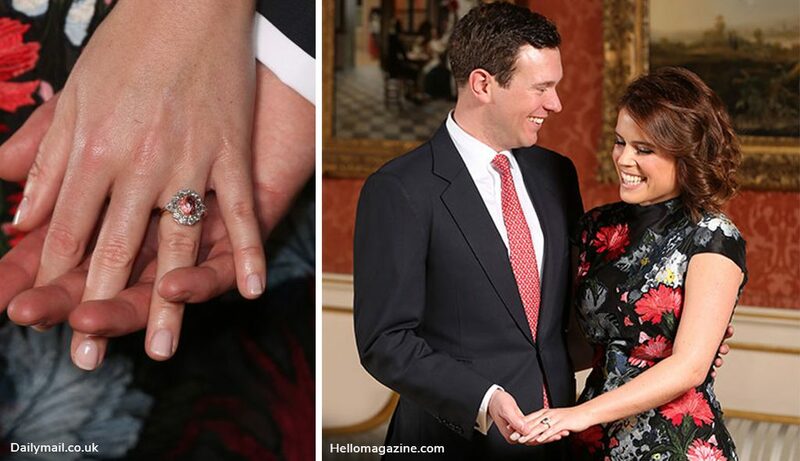 Jack Brooksbank proposed without a ring, then Princess Eugenie and he designed a rare pink sapphire showstopper together (hot tip: we’ve found that 60% of women take part in their engagement ring buying process). Their ring is a serious spokesperson (spokes…ring?) for teamwork. If there’s anything we love more than her love story with Prince Harry, it’s Meghan Markle’s engagement ring! Though we can’t promise side stones that belonged to Princess Diana, our lookalike features a surprise metal swirl detail behind the three diamonds. Prince William famously proposed to Kate with Princess Diana’s sapphire ring so that his mother could be a part of their wedding, making us cry all the sad and happy tears. Mirror Diana and Kate’s style with this gemstone pop of color. Queen Elizabeth’s engagement ring may not have been featured on The Crown, but its diamonds were taken from a tiara. As a tribute to his mother (we sense a pattern here…), Prince Phillip proposed with diamonds taken from his royal mum’s headpiece. Copy the Queen Mum’s style with this royal stunner! Sure, the relationship between Fergie and Prince Andrew didn’t work out. But can you blame us for obsessing over her fiery ruby engagement ring? A diamond star halo around this gemstone creates a spectacular burst of scarlet. As a pre-Markle American actress marrying into a royal family, Grace Kelly set the standard for a real-life fairy tale. The Prince of Monaco proposed with a 10.47 carat (!!) emerald cut diamond flanked by baguettes. Oo. La. Love. Want to design your own take on these royal engagement rings? Shop now! Obsessed with one (or more) of these royal engagement rings? Sound off on Instagram, Facebook, Snapchat, Twitter, or in the comments below!